Today is Tuesday and that means a new challenge over at Scrappin with I Did It Creations. This week is the 3rd challenge and is entitled 'Fantasy'. This weeks prize is sponsored by the Crafty Purple Frog and the DT got to have a play with a couple of her Fantasy designs. They are really easy to use, just print, cut and make up your pyramage or decoupage...simple! Initially I found the theme a little difficult this week so I took inspiration from the Fantasy drawing on the decoupage I made, which features a purple cat. 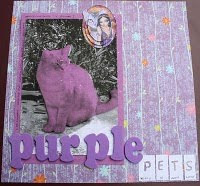 It made me imangine the world with purple pets and I used an image of my mum's beautiful cat 'Kitty' and turned him purple! What do you think??? Definitely out of my comfort zone but great fun to make! Please visit the challenge at Scrapping with I did it Creations and join in the challenge to win the fab prize (I have spotted a pig image on the Crafty Purple Frog site which is gorgeous.... you know me and my love of pigs!). The other members of the design team have come up with some fabulous ideas to give you inspiration, go on over nad check it out!